A skeletal x-ray is an imaging test used to look at the bones. It is used to detect fractures, tumors, or conditions that cause wearing away (degeneration) of the bone. The test is done in a hospital radiology department or in the health care provider's office by an x-ray technologist. You will lie on a table or stand in front of the x-ray machine, depending on the bone that is injured. You may be asked to change position so that different x-ray views can be taken. The x-ray particles pass through the body. A computer or special film records the images. 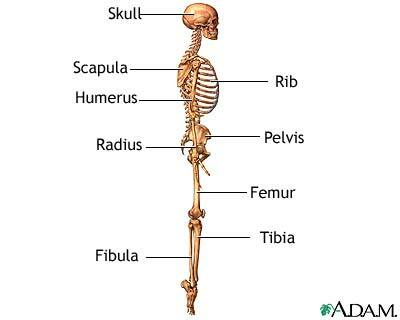 Structures that are dense (such as bone) will block most of the x-ray particles. These areas will appear white. Metal and contrast media (special dye used to highlight areas of the body) will also appear white. Structures containing air will be black. Muscle, fat, and fluid will appear as shades of gray. Tell the health care provider if you are pregnant. You must remove all jewelry before the x-ray. The x-rays are painless. Changing positions and moving the injured area for different x-ray views may be uncomfortable. 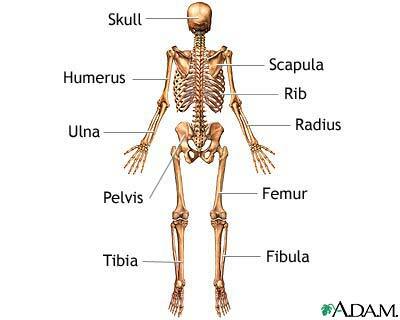 If the whole skeleton is being imaged, the test most often takes 1 hour or more. There is low radiation exposure. X-rays machines are set to provide the smallest amount of radiation exposure needed to produce the image. Most experts feel that the risk is low compared with the benefits.